In South Africa HIV patients continue to feel the effects of a chronic shortage of health workers. Zinhle Mapumulo looks at a problem that refuses to go away. The Tshepang Clinic in Pretoria is fully booked. The 26 people who enrolled here in November for HIV treatment will have to wait until March for the first of three counselling sessions. Completing these sessions is mandatory for anyone who wants antiretroviral drugs. One doctor and two nurses work at the clinic, based at the Dr George Mukhari Hospital. William Matereke has sympathy for the patients on the waiting list but there is nothing he can do. “At times we utilise volunteers in conducting counselling sessions. But we cannot rely on them – we need permanent staff on board if we intend to run a proper ART clinic," he says. To qualify for antiretroviral (ARV) treatment in South Africa your CD4 count, which measures the white blood cells that control immunity, must be less than 200. Even if you are critically sick and your CD4 count has dropped drastically you still have to follow the procedure of registering for treatment and attending three ARV adherence counselling sessions. After the sessions the doctor reviews your cell count and viral load. If the CD4 count is still below 200 and you meet all the necessary requirements you can begin treatment. Zibuyile Mahlangu [not her real name] lives in Soshanguve and is waiting to start treatment at the clinic. The frail 27-year-old is scheduled to come back in March next year for her second counselling session. She takes daily vitamins to boost her immune system but does not know when she will be approved to begin taking HIV drugs. "I am scared that I will die before accessing treatment,” she says. “I know I have to attend three sessions before they can put me on treatment but it seems very long to me. I feel weak and my weight keeps dropping but there is nothing I can do besides waiting and hoping my turn will come soon." What Zibuyile Mahlangu is going through is common, especially in rural areas where there is a severe shortage of health staff. The government has acknowledged the problem, but many are frustrated by the rate of progress. The international medical charity Médicins San Frontières (MSF) has been vocal in criticising the situation. In a study published earlier this year it estimated that 718,000 people needed ARV treatment but weren’t getting it. “For policymakers our message is that you will be held responsible if you are not reactive or flexible enough to find solutions to the staff shortages quickly,” he adds. However, there is confusion about the extent of the waiting-list problem, with civil society organisations and the government disagreeing publicly over figures. 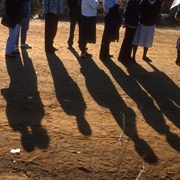 Last year the health minister Manto Tshabalala-Msimang said the waiting list was around 31,000. But AIDS lobby group the Treatment Action Campaign had estimated it at about half a million. Ministry of Health spokesman, David Khalambo, says data collected in June 2007 showed around 6,000 people on the ARV waiting list and told me it could be higher or lower than that today. He thinks it is not entirely fair to blame the government for people dying while on waiting lists. “In many cases people present at the clinic when they are critically ill and their CD4 counts are very low. This person cannot be treated immediately because the ARV drugs can kill him. He has to be nursed to health and then begin with treatment," he says. The health ministry has embarked on a plan to retain health workers. Earlier this year it announced it would increase the number of ARV sites to help with the backlog. Indeed 20 more sites had been installed at clinics and major hospitals around the country by June this year. It has also recently put up wages in a bid to stop nurses and doctors leaving the public sector. The government is in a race against time to meet its own ambitious targets. It has promised access to treatment for 80 per cent of those who need it by 2012. It remains to be seen whether these latest incentives to stem staff shortages will prove enough to prevent more people from dying on ARV waiting lists. is there a contact email address for this clinic? I am looking to work for an HIV charity/clinic in South Africa from April 2008 onwards and would like to see if there is anything i can do here to help? thank you Louise for wanting to lend a helping hand. I am sure the clinic would appreciate any help. I can give you telephone numbers of the TAC representative heading the counselling center at Tsepang ART Clinic, her name is Kgawugelo and her numbers are +27764592560. Also try getting hold of Gordon who runs the Regional TAC office in Johannesburg he will gladly help on +27784563845. He would also direct you to other clinics like Zola ART clinic in Soweto where they are also facing a huge backlog. This is good that the people are coming to the Tshepang Clinic for the treatment,the HIV generally occurs after transfer of body fluids from an infected person to an uninfected one,and the treatment is most and really important,and also a condition in humans in which the immune system begins to fail, leading to life-threatening opportunistic infections,so great things you share. I like the style of your writting. Not only is this a great idea, it is so fun to read the blog to find out about the fun stuff you find! Thanks very much, I have learned a lot from your post. Well done, really! I was suggested this website by my cousin. I'm not sure whether this post is written by him as no one else know such detailed about my difficulty. Powered by Japanese quartz movement and fueled by natural and artificial light. A good blog with exciting content, that's what I need. Thank you for keeping this site.